Vanguard Selected Value Fund (VASVX), best U.S. stock mutual fund. Value investing is extremely popular among long term investors. Many different studies have shown over the long term period, the value investing style will beat other investing styles like growth investing. The next fund best 25 Kip fund will be another Vanguard fund. 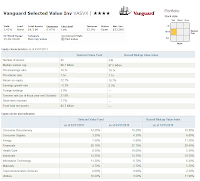 This Vanguard Selected Value fund invests primarily in undervalued companies especially mid cap value stocks. A company is considered a mid cap, if the company has a market capitalization between $2 billion and $10 billion. The investment in Vanguard Selected Value is looking for capital growth and income growth in long-term. It invests primarily in medium-size U.S. companies’ stocks. The consideration of the stocks selected are the undervalued stocks that are out of favor with investors and are trading at below average price related to earnings and book value. James P. Barrow has managed this Vanguard fund since March 1999. He is the principal and founding partner of Barrow, Hanley, Mewhinney & Strauss llc. As the primary investment advisor, Barrow, Hanley, Mewhinney & Strauss llc is managing 73% of fund assets. Some of the fund assets (about 24%) are also managed by other investment advisor Donald Smith & Co Inc (portfolio manager: Donald G Smith). The fund has 0.47% yearly expense ratio while the average in the category is 1.36%. The fund is available in both brokerage and IRA account with the minimum initial investment of $25,000 and $100 of the minimum subsequent investment. There is neither 12b1 fee nor sales load fee applied. There are 76 brokerages in which this fund can be purchased include T. Rowe Price, Commonwealth, TD Ameritrade, etc. The performance of the fund is 18.46% over the past one year, 5.36% over the past five years and 8.91% over the past ten years. The last dividend distributed in 2007 was 1.55%. VASVX fund has 4-star return rating from Morningstar. It has 6.82% of year-to-date return with a total of 9 years of positive return and 5 years of negative return. The best total return in 1-year was achieved in 2009 with 36.26%. The worst 1-year total return was experienced in 2008 with -35.49%. The fund also has a redemption fee of 1% if the fund is held less than 1 year. The top 10 largest holdings has 21.8% of total net assets as of March 31, 2011 are Stanley Black & Decker Inc., Coventry Health Care Inc., Capital One Financial Corp, Discover Financial Services, Yamana Gold Inc., Willis Group Holdings plc, Murphy Oil Corp, Goodrich Corp, Seadrill Ltd and Micron Technology Inc. The top 3 equity sector diversifications as of December 31, 2010 are Financials (29.40%), Energy (11.30%) and Consumer Discretionary (10.90%). There are 64 different stocks in this fund asset. About 5.9% of fund asset is invested in foreign stocks holdings. What is the risk you might ask? Stock market risk: price will rise and decline depending upon market condition. Value investment style risk: Since the fund invests in value mid cap companies, these companies may be more volatile than value large cap companies. Manager risk: Poor selection by fund advisor due to particular sector, category, group. This may cause the fund to underperform the fund index or other benchmark. Asset concentration risk: Since this fund may be less diversified, the fund may be volatile at the times. The performance of this VASVX fund, based on the load adjusted return, is 17.80% over the past year, 4.91% over the past 3-years and 6.79% over the past 10-years. It has 5-stars rating from Morningstar. Since its inception, this fund has recorded 9 years of positive return (best in year 2009 with 36.26%) nad 5 years of negative return. The YTD-return is -2.99%. As of September 30, 2011, the top 10 holdings of this Vanguard fund are Royal Caribbean Cruises Ltd, Constellation Energy Group Inc, Yamana Gold Inc, Discover Financial Services, Coventry Health Care Inc, Goodrich Corp, International Game Technology, Wills Group Holdings PLC, CenterPoint Energy Inc and Capital One Financial Corp. These top 10 companies represent 24.0% of the total net assets. The top sector holdings (stocks) are Financials (26.9%), Industrials (15.0%), Utilities (12.7%) and Consumer Discretionary (12.3%). 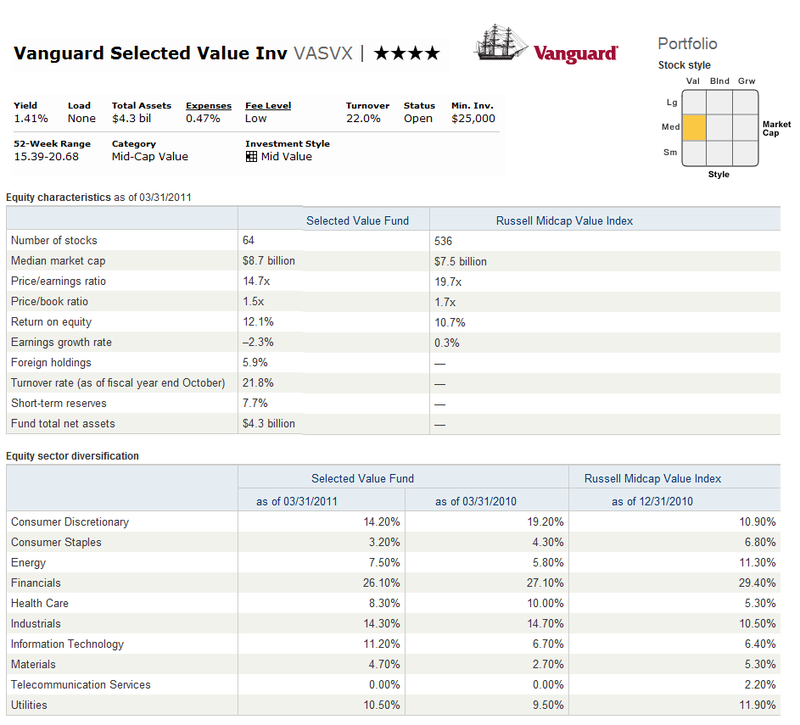 Note: This Vanguard Selected Value Fund (VASVX) was part of Kiplinger's 25 best mutual funds before. If you are interested in other Kip 25 Best fund, please check my previous articles. If you need the Top 25 list, you can check my main page for details of these Kiplinger 25 best mutual funds.